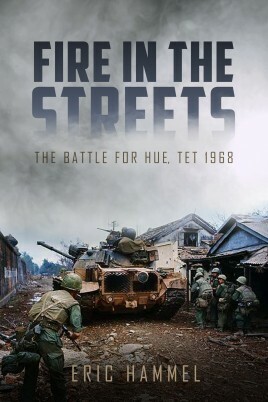 The definitive and highly-acclaimed account of the battle for Hue during the Tet Offensive in 1968. The Tet Offensive of January 1968 was the most important military campaign of the Vietnam War. The ancient capital city of Hue, once considered the jewel of Indochina’s cities, was a key objective of a surprise Communist offensive launched on Vietnam’s most important holiday. But when the North Vietnamese launched their massive invasion of the city, instead of the general civilian uprising and easy victory they had hoped for, they faced a devastating battle of attrition with enormous casualties on both sides. In the end, the battle for Hue was an unambiguous military and political victory for South Vietnam and the United States. In Fire in the Streets, the dramatic narrative of the battle unfolds on an hour-by-hour, day-by-day basis. The focus is on the U.S. and South Vietnamese soldiers and Marines–from the top commanders down to the frontline infantrymen–and on the men and women who supported them. With access to rare documents from both North and South Vietnam and hundreds of hours of interviews, Eric Hammel, a renowned military historian, expertly draws on first-hand accounts from the battle participants in this engrossing mixture of action and commentary. In addition, Hammel examines the tremendous strain the surprise attack put on the South Vietnamese-U.S. alliance, the shocking brutality of the Communist “liberators,” and the lessons gained by U.S. Marines forced to wage battle in a city–a task for which they were utterly unprepared and which remains highly relevant today. Re-issued in the fiftieth anniversary year of the battle, with an updated photo section and maps this is the only complete and authoritative account of this crucial landmark battle.